Pre-workoutHi Tec AMG - 875g + 50 kaps. Package: 875g + 50 kaps. A comprehensive preparation before training, which also provides energy, material of building, stimulators and regulators anabolic hormones, strong plant adaptogens and anti-catabolic. A.M.G. is a comprehensive pre-workout preparation, which simultaneously provides the energy, the substance of building, stimulators and regulators anabolic hormones, strong plant adaptogens and anti-catabolic. A.M.G. = ALL IN ONE GROW MUSCLE FORMULA is a comprehensive pre-workout preparation, which simultaneously provides the energy, the substance of building, stimulators and regulators anabolic hormones, strong plant adaptogens and anti-catabolic. A.M.G. 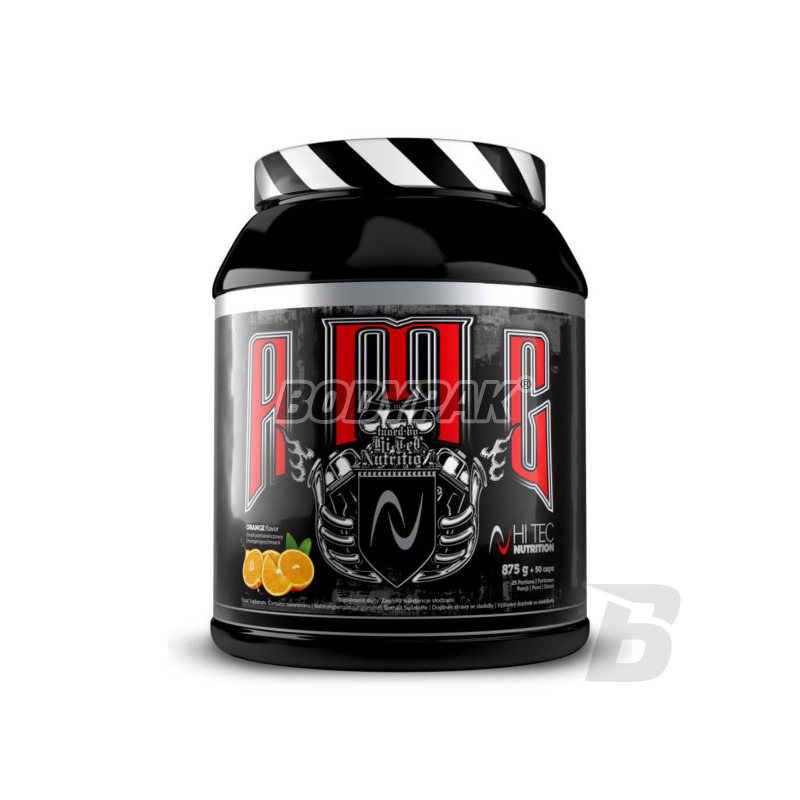 also it includes a full complex of nitric oxide boosters, thus significantly enhances the effect of the muscle pump during training. A.M.G will increase the intensity and efficiency of training which can lead to a faster increase in strength and muscle mass. What is the most common cause of unsuccessful training or not to go to the gym? Lack of energy and desire to exercise, lack of strength, muscle pain, fatigue from lack of sleep, chronic stress, overtraining. Everything can be remedied if before training to comply with the appropriate combination of different ingredients that will add energy, strength and liquidate fatigue and boredom resulting from stagnation. FORCE! The last global trend, supported by research and experience many athletes confirms the concomitant use before training a number of different chemical forms of creatine. Each of these molecules delivers creatine and another compound of the stimulating energy and anabolism of muscle cells. In many areas they support creatine which adds a lot of strength during intensive training. Alpha-ketoglutarate, malate, citrate, and pyruvate compounds used by the cells for synthesis of energy used for muscle contraction. Vitamin B13 or orotic acid maintains an optimum level of ATP and nucleotides which muscle cells stimulated contractility of the muscle fibers, potentiate muscle protein synthesis and thus increase muscle mass your. The combination of creatine and HMB gives the mega powerful protection against catabolism and causes metabolic breakthrough in the synthesis of new muscle proteins. While the ester bonds of creatine protect the molecule against degradation during the absorption and distribution in the body. Only a combination of several synergistic active compounds will allow you to re-energizing feel a burst of energy and will "kick" before exhausting workout. Every effective pre-workout energizer should contain a combination of caffeine, taurine, glucuronolactone, B vitamins, tyrosine and dextrose. Caffeine Dextrose stimulates the central nervous system and stimulate blood concentration, speed decision-making, reduce response time and reduce fatigue psychophysical. In addition, caffeine stimulates the cardiovascular system and expands bronchial tubes, resulting in improved cardiovascular fitness. In addition, it has a significant impact on the type of fuel burned during exercise, ie. Save muscle glycogen stores and stimulates the decomposition and oxidation of fatty acids, our metabolism so that exercise becomes more efficient and catabolic processes in muscles are being reduced. The idea of ​​combining caffeine with taurine, glucuronolactone and vitamins of the B group is based on improving the operating parameters "actuators" cells or mitochondria and the entire chain of cellular respiration. These changes at the molecular level move on our mood, a desire to fight the ironmonger and strength of muscle contraction. Moreover, high levels of serotonin in the brain, Call fatigue and sleepiness and are caused by a large influx of tryptophan (amino acid), which is synthesized from this neurotransmitter. BCAA branched amino acids compete with tryptophan during the penetration into the brain. Thus, pre-workout supplementation with the amino acids taurine and BCAA is an effective way to get rid of mental and physical fatigue. L-Tyrosine is an amino acid extremely useful in situations of high stress associated with strenuous exercise or competition. Fighting ironmonger triggers huge psychophysical stress, which leads to the consumption of certain neurotransmitters in the brain and thus the loss of speed, coordination and endurance. L-Tyrosine, as a precursor of stress hormones: epinephrine and norepinephrine, and dopamine, corrects the deficiency of these substances in the body, so you can cope with the difficult challenges of the regime treningowemu. Almost every session bodybuilding phenomenon causes swelling of the muscle through the blood flow to the areas covered by their intensive work. This is called. "Muscle pump" that makes every athlete with delight looks at himself in the mirror after training. This effect can intensify the workout by giving before certain substances to facilitate the expansion of the blood vessels or vasodilation. It all boils down to increased production of nitric oxide, which relaxes the smooth muscles in the blood vessels, allowing more blood is able to reach all body cells. Improvement of blood circulation intensifies the effect of the muscle pump. 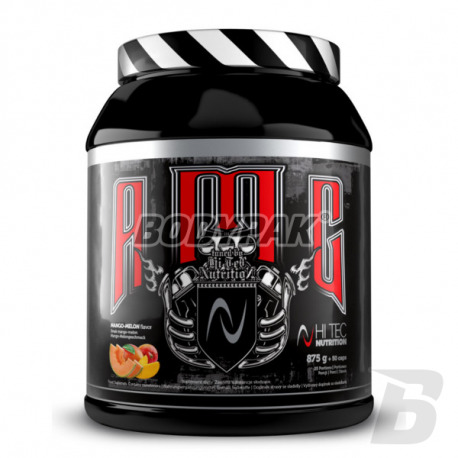 Direct raw material for the production of nitric oxide is arginine. However, it appears that the same are other substances such as ornithine and citrulline, which meet with arginine on various metabolic pathways. The most effective is therefore a combination of all mediators synthesis of nitric oxide - arginine, ornithine and citrulline. • increases the regeneration of a pool of ATP and phosphocreatine by an increase in the activity of the Krebs cycle. Another important compound vasodilatory while inhibiting catabolism exercise is α-ornithine ketoglutarate (OKG). OKG shows its properties as muscle cells raises the level of various important amino acids such as glutamine, arginine, leucine, isoleucine, tyrosine, and proline. Of the different relationships and connections arginine, ornithine or citrulline deserves a special attention KIC or α-ketoizokapronian. As the first product of degradation of leucine inhibits the enzymes involved in the oxidation of BCAA. This means that more leucine be utilized for the initiation of protein synthesis and muscle do not burned during a workout. Any activity consisting in stopping the degradation of leucine to bring the effect of an increase in protein synthesis and muscle cell repair after training. Other Ingredients: Aromatic substances, sweeteners (sodium cyclamate, aspartame, sodium saccharate), MTC oil, emulsifiers (lecithin, MTC oil), gelatin (capsule sheath), magnesium stearate (anti-caking agent), orange yellow ). Kupuje kolejną puszke. Daje po gaciach maksymalnie. Pompa rozwala. Ale nie na każdy organizm dziala identycznie. Dobry skład, chociaż ta synergia.. trochę naciągana moim zdaniem, jednak coś w nim działa i to solidnie. solidny skład, trochę zbt rozbudowany jak na moje oko, ale ważne, że działa!